Lifting, leveling and adjusting is made easier with load leveling jacks. They can be used to perform a variety of functions like lifting machinery and other loads, dropping orders on leveling pads or different sets of wheels, or simply adjusting loads to suit business operations. 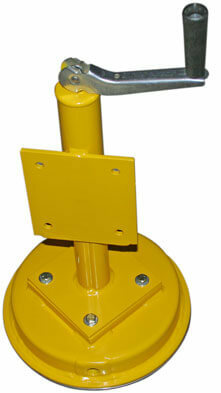 For greater flexibility and distance coverage, these lift jacks are mounted onto air bearings permanently. This allows you to directly move the load from the air lift unit. These jacks are ideal for scaffold type of settings that have multiple levels; you can level the load according to the structure and transport it to another area in a single operation. All of this can be done simply by plugging the air shop into a valve. Our air lifting jack has the manual capacity to lower and lift loads from a given location with the help of a cranking handle. The heavy load can also permanently be attached to the lift jack with the help of a metal attachment plate under the crank handle. Moreover, the air flow control and air valve installed in this lifting mechanism makes this device easy to operate. Please note: all jacks are supplied with top-mounted crank handles as standard. A side-mounted crank handle is available on request. A 12-inch lifting jack with top-mounted crank handle fitted as standard. Underside of lifting jack showing air bearing and load pad.